The Speedy really is a strap monster and I'm so glad I have one but does anyone have it have their ONE watch? I have over 20 watches and looking through all these photos I could ALMOST make it my one watch. Anyone slimmed their multi watch collection down to just a Speedy? I only own a Speedy and a Citizen diver. I wear the Speedy daily and the Citizen some on the weekends. It's a pretty awful looking bracelet in my opinion and I guess most people would be inclined to agree. Not all posts elicit a response, be it good or bad. Ok this is weird and I’m confused. First I was surprised I had never heard of these Speidel bracelets that have been around for decades, not a peep on WUS that I saw. Then I share my discovery and get no response. Am I missing something? Do people just hate these? I feel left out of some secret. Am I like the newb WUS member that tells everyone about his really cool new Invicta? What did I miss guys? I wouldn't wear one on my Speedy but I tried one on my Seiko Turtle and I like it a lot. It's better with some than others but I do definitely like the flex bracelet in some cases. I won't lie, I think they look ugly and remind me of old mens watches. Sorry. My wife has one on a vintage Micky Mouse diver (really) that I bought her and she refuses to let me change the strap as she loves it for the reasons you state. We're all different, enjoy it in good health. Hey all, fair enough. I do love it, and I was surprised that it seems to be one of those love it or hate it items. And I guess the "love it" crowd will be smaller than I originally thought. I'm still going to enjoy it, but it is worth it getting these opinions and realizing that a lot of people will look at it as ugly. Might encourage me to get a different strap because I don't want my Speedy to feel ugly, it deserves the best! 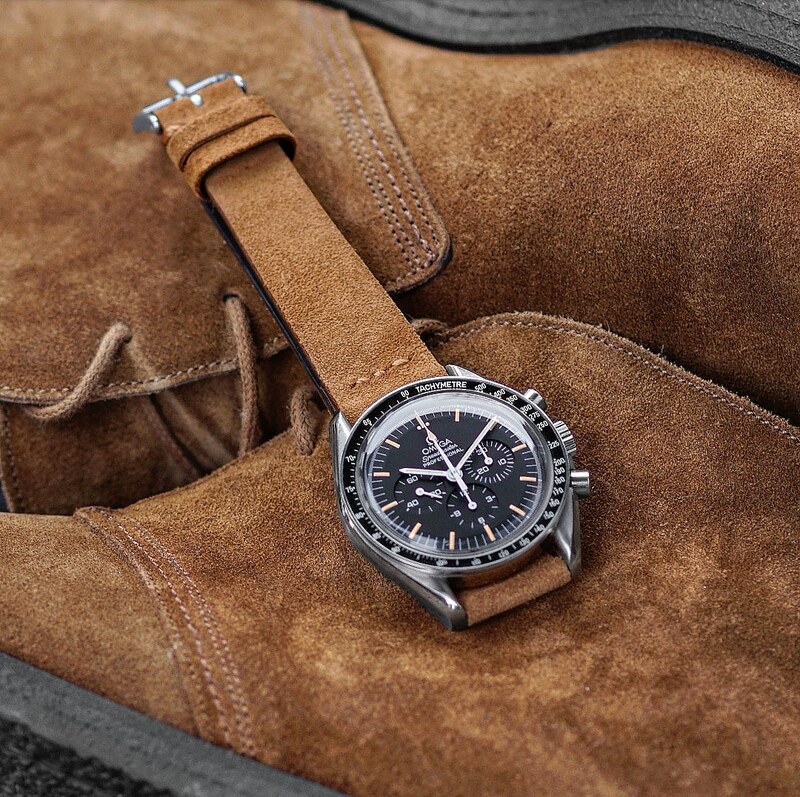 I've always been on the lookout for a nice 'curved end' strap that fits the speedy. Over the years, I've owned the Omega double-ridged shark, the perforated rally and the coramide. Unfortunately, although beautifully made, none seem to last longer than a couple of years with daily use. They cost a small fortune too of course. Seems really hard to find good 3rd party alternatives. Hirsch seem to be making some nice ones now for reasonable money. Recently, I came across a curved end, silicone rally-style strap, on ebay. It's a standard buckle and not deployment, but for $20 who cares! there are various colours for the perforation 'holes'. I went for white, which matches the black/white speedy theme. Really chuffed with it + think it fits and suits my speedy (sapphire sandwich) very nicely !! Here are some pics, not great, but hope you get the idea. Strap is available here (no affiliation ! ).